Refined yet relaxed, chic yet comfortable, sophisticated yet simple. 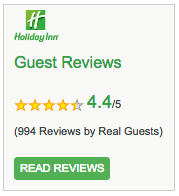 The 270 deluxe guest rooms and 26 suites at the Holiday Inn Charlotte Center City are all of this and more. Thoughtfully designed and creatively decorated, we’re the smart choice among Uptown Charlotte hotels for guests seeking affordability without sacrificing style and service. All of the comfort of home, but with plenty of hotel-style perks to boot! Located on the 15th floor, the Center City Club Lounge is privately keyed for Spire Elite and Platinum Elite IHG® Rewards Club Members and negotiated accounts. With beverages, daily deluxe continental breakfast, and a selection of hot hors d'oeuvres, beer and wine in the evening, it's an ideal place to grab a quick, quiet bite before a day of meetings or to relax and unwind after the work day. ​Experience ultimate relaxation with the Simmons Deluxe Pillow Top Mattress surrounded with triple sheeting, both firm and soft deluxe pillows to get a peaceful night's sleep. For entertainment, enjoy watching the cable TV or surfing the Web via complimentary high-speed, wired and wireless internet access. A desk, microwave, laptop sized safe, Keurig coffee maker and refrigerator are included. In addition to standard amenities and complimentary high-speed, wired and wireless internet access, our suites feature extra perks, such as a living area with a sleeper sofa. For even more convenience, all suites are equipped with a microwave, refrigerator, Keurig coffee makers, laptop sized safes and 46" televisions.